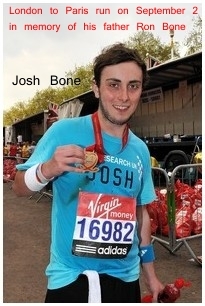 JOSH BONE aged 21 is running from London to Paris in memory of his father on 2 September for Dorothy House Hospice and Cancer Research UK. There have been articles in the Bath Chronicle, Bath Magazine and Bath Life recently. He is very young, possibly the youngest person to have attempted this run, and he needs all the support he can get.